East Texas Precast third job for the Houston Methodist hospital system started earlier last week. 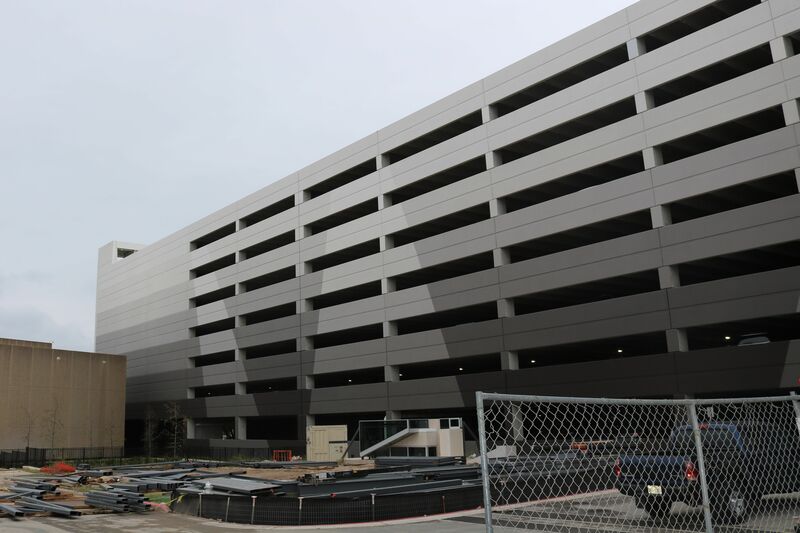 Last year we completed two parking garages for Houston Methodist hospitals in The Woodlands and Sugarland. This time we've moved to the Willowbrook area located just off the intersection of I-249 and FM 1960. Here the Houston Methodist Hospital system is looking to increase its capacity, but with limited area available for expansion due to the surrounding commercial and office areas their only option is to build up. That is why they have decided to go with a precast parking garage to expand. Coloring concrete has long been an option for those who want to add an additional depth to their concrete parking project. But with advancements over time the number and variety of options available to an owner are numerous. One of the most common and well known options is adding colored pigments to the concrete mix. This allows for a consistent and evenly distributed color throughout the concrete mix, and is easily replicated on later projects with a well documented mix design. Historically this has been done with colored oxide powders, but in more recent times liquid additives have been found that can allow for more customized color options. The next option to consider is paint. Now while painting concrete does seem straight forward it should be noted that to paint concrete appropriately additional steps usually have to be taken to prep the concrete that might not be there when having to paint other building surfaces. But the advantage paint has over other coloring methods is that you can achieve a variety of colors on the same piece of concrete, which can allow for more intricate color designs on your project. The final method we will discuss here is staining concrete. 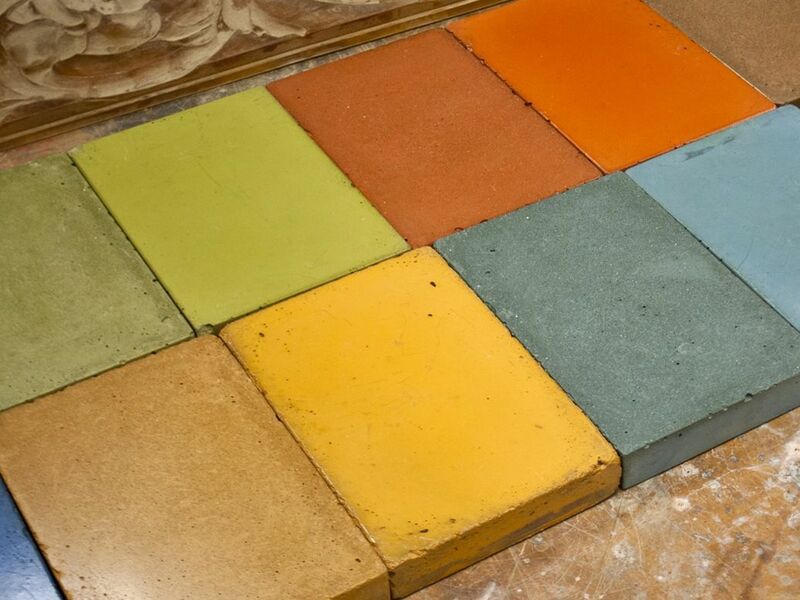 This is one of the newest methods used to color design concrete. The process of staining concrete revolves around using an acid based solution that penetrates an existing concrete surface to produce a permanent color. Staining concrete can achieve a variety of colors much like the other two methods, and is a great option to revitalize an already existing concrete project. Concrete is known for its durability but without a maintenance plan, you will not be able to maximize the lifespan of your structure. 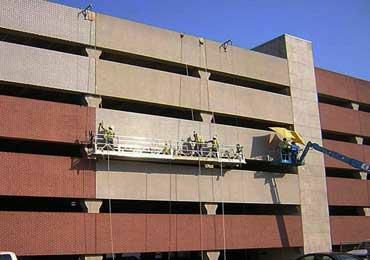 In addition, consistent maintenance ensure that your parking structure is kept aesthetically appealing. Generally speaking, maintenance can be broken down into three separate types. General trash removal to maintain sanitation throughout the garage. Maintaining any lighting fixtures that are present. This can really help improve users sense of security and the aesthetic beauty of your garage. Re-painting of painted surfaces. This can help users use your garage more efficiently as well as increase performance. At a minimum, a maintenance inspection and general housekeeping should occur once a year. Have you ever been in a parking structure where you could not find a parking spot, only to leave and find entire rows where no one has parked? This could be due to poor wayfinding or the ramping system used. Both one-way and two-way ramping systems have their advantages and disadvantages we encourage you to look at the below chart to see, which might be most beneficial to your parking structure. Just like LEED building structures, there has been a movement to certify parking structures that make their parking environmentally friendly. When it comes to parking structures, the largest carbon footprint marker is what structural material the project is designed with. It is believed that concrete is a material that has a negative impact on sustainability. When designing a parking structure, the first decision that needs to be made is what structural material will be selected. Structural material on most parking garages will represent 50% of your total budget. There are three primary options to consider: Cast-in-place (CIP) concrete, steel framed, and precast concrete. Each one of these building materials has its own advantages and disadvantages. The first material you can consider is precast concrete. Almost all garages that can be constructed using precast concrete are currently precast because of its architectural versatility, reduced construction time, and managing risk on job sites. 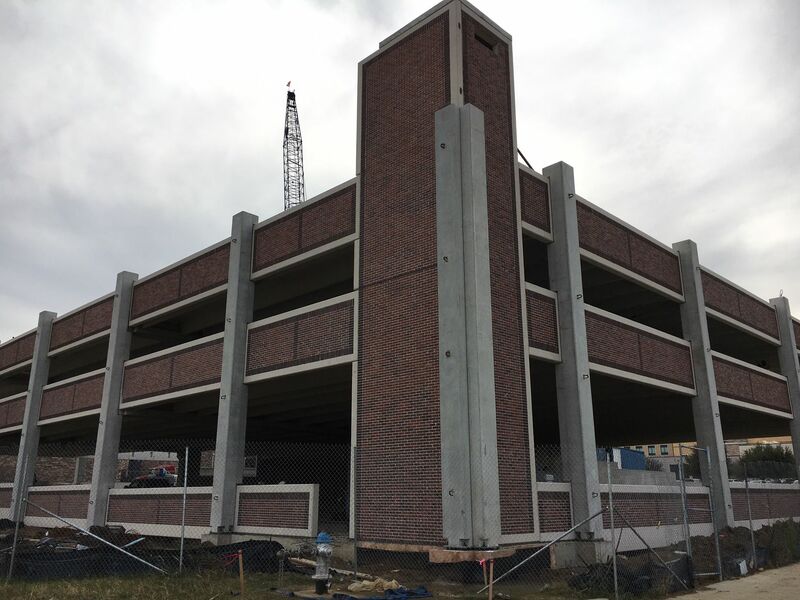 East Texas Precast is the leader in precast parking structures in Texas, but we get questions from all over the country about parking projects. We took some of our most commonly asked questions, and went to the experts for the real answers: Cesar Diaz, Noli Alarcon, and Chad Snyder (Bios below). 1. How does someone determine the number of parking spaces they need? Cesar: Typically, this answer would come directly from the Owner who would, at that point; have a very good idea how much parking they would want at the very least. We would check this wish list item against local codes to assure that we are providing, at the very least; the minimum required parking for such building typology. Did you know that roughly 30% of our cities lands are used up by parking? Parking is an essential need for almost any land development in America, and many places have requirements for parking that have to be met depending on what your building is. The video below by Vox describes how this process works and how it came about. One of the best ways to meet these requirements with the ever shrinking land available to us is with parking garages. Parking garages give the advantage of being able to put more parking spots in a smaller footprint saving valuable space over the conventional parking lot. East Texas Precast is starting one of the tallest above ground parking structures in the United States. Located on the 94th block in Downtown Houston we are starting our newest 1151 piece, 13.5 level structural precast garage. This garage was contracted to use by Hoar Construction, designed by Gensler, and was engineered by Walter P. Moore. The 94th block in Houston is in the heart of downtown. This parking garage is surrounded by hotels, apartments and restaurants. It is located directly across Rusk Street from the historic Texaco building, which is now The Star Apartments. It should really serve a vital role in facilitating parking needs for the Downtown Community of Houston. This week East Texas Precast is glad to have finished an amazing parking garage for the Flower Mound community. This 333 piece, 3 bay garage was built for Riverwalk Medical Park in Flower Mound, Texas. The garage features a brilliant thin-brick exterior. This brick finish is a great example of precast concrete's versatility in design. As you can see in the photos below we are able to achieve the aesthetic beauty of brick in a parking garage, while also having the usual benefits of precast concrete like strength and production speed. 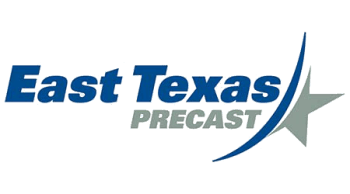 If you're interested in learning more about precast finishes check out our architectural resources on our website at http://www.easttexasprecast.com/architectural-resources. We hope that the over 450 parking spaces in the garage helps provide adequate parking for the surrounding medical facilities, and helps to improve the Flower Mound community. We'd like to thank our partners Schwob Building Company, Datum Engineers, and Architeriors for helping in this project, and as always keep tuned to http://www.easttexasprecast.com/news for more updates on our projects.